Paul graduated from university in 1987. He has done a variety of jobs, including librarian and researcher. He currently lives in Florida. What Kind of Snake Is a Southern Black Racer? 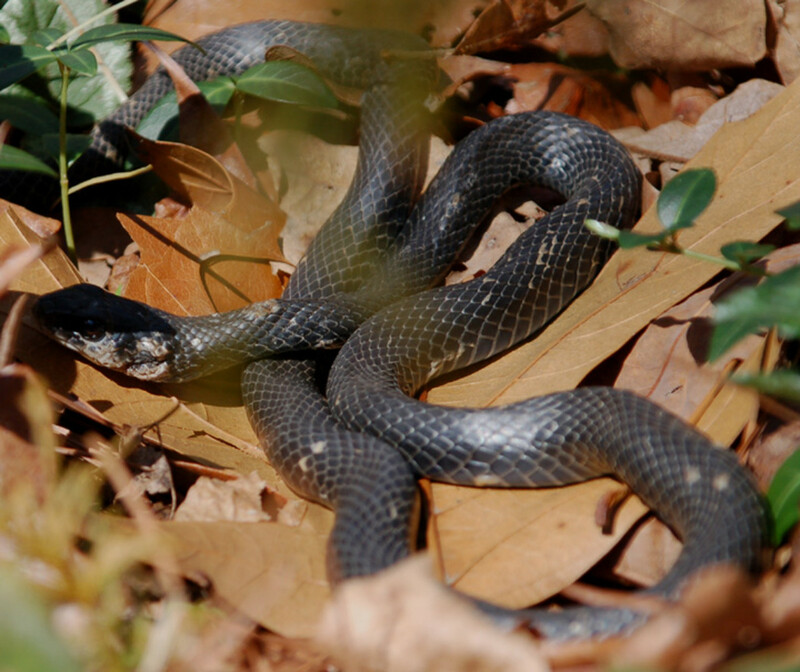 The southern black racer (Coluber constrictor priapus) is a common subspecies of the Coluber constrictor. 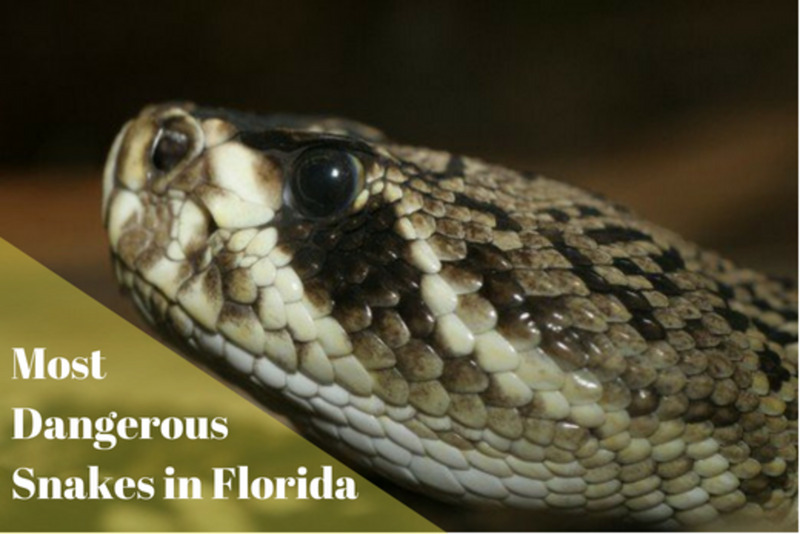 These snakes are non-venomous and are usually found throughout the southeastern United States, especially Florida. Besides the southern black racer, there are ten other subspecies of Coluber constrictors. Are Southern Black Racers Poisonous? Southern black racers are not poisonous. Instead of using venom, these snakes prefer to crush their prey into the ground and swallow it whole. With a scientific name like "constrictor," this behavior is very different from what many would expect. In any case, they rarely suffocate their prey by coiling themselves around it. What Do Southern Black Racers Look Like? As its name suggests, this snake is mainly black in color, with a black dorsal side, a gray belly, and a white chin. 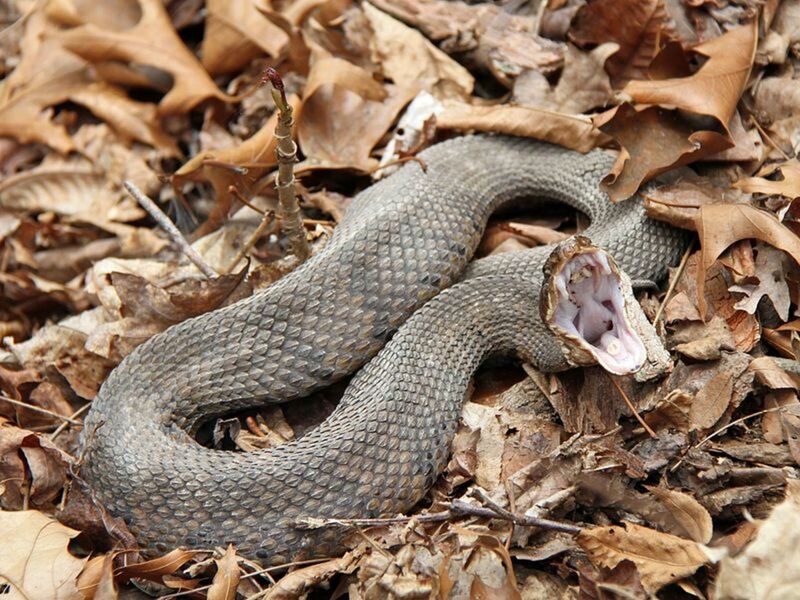 The white chin causes some to kill this snake, believing it to be the extremely dangerous cottonmouth, often called a water moccasin, a snake that also has a white chin. Other snakes that are similar in appearance to the racer are the indigo snake, the rat snake, and the garter snake. Juvenile racers are blotched gray to reddish brown, and are smaller than the adults, which have an average size of between 20 to 55 inches (0.6 to 1.4 meters). The longest black racer ever discovered was 72 inches in length. Where Do Southern Black Racers Live? 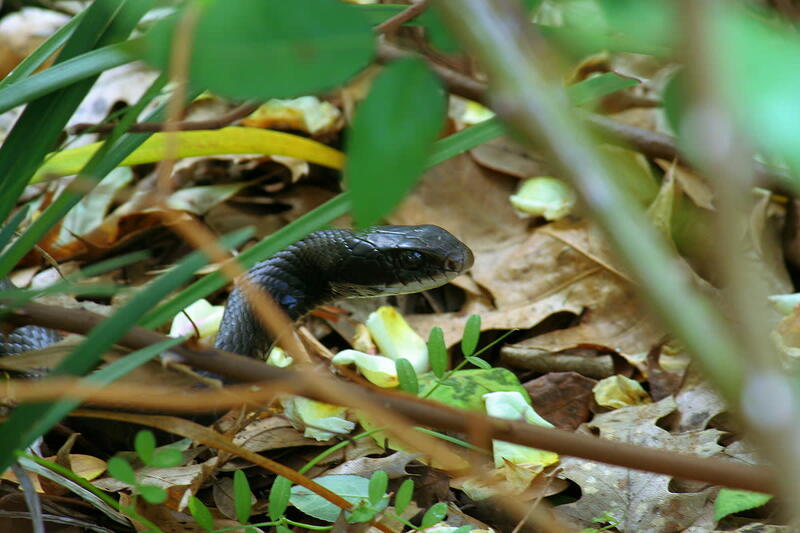 Southern black racers prefer to live in wooded areas, brush, and thickets, but can also be seen in more open areas. Like all cold-blooded specimens, which regulate their temperature by moving in and out of sunlight, this snake will reside in any place where there is both exposed and covered ground. 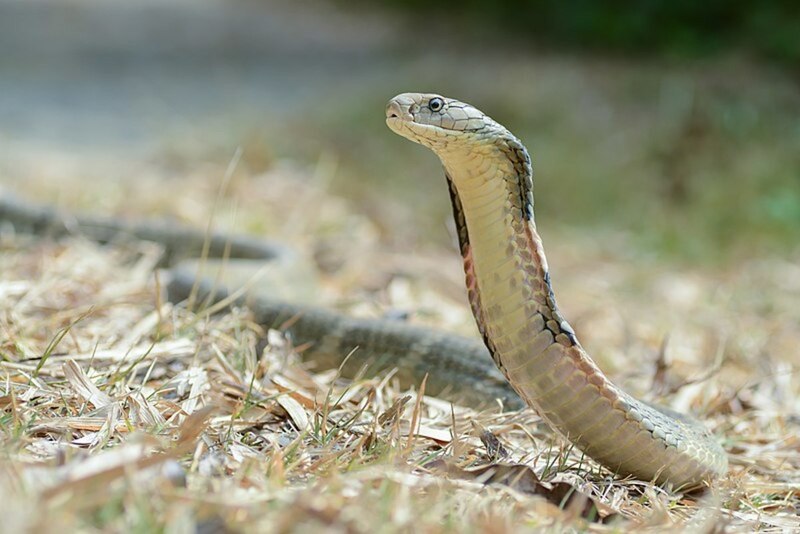 As they are very active in the daytime and less afraid of humans than most snakes, it is fairly common to see these snakes in suburban yards. Although they are not venomous, they can be aggressive, especially if handled. These snakes will never tolerate being picked up, and will defecate a foul smelling musk if provoked. What Do Southern Black Racers Eat? Black racers are predators that live on frogs, toads, lizards, snakes, rodents, and other small mammals. They essentially eat any small animal they can overpower through suffocation or by crushing them into the ground. While these snakes are the enemies of the aforementioned specimens, the natural enemies of black racers are domestic dogs and cats, coyotes, and birds of prey such as the red-shouldered hawk and the broad-winged hawk. These birds use their extraordinary eyesight to identify black racers and attack them from above. The element of surprise these birds employ when attacking black racers renders their speed and ground awareness ineffectual. How Do Southern Black Racers Behave? One of the key facts to remember about these snakes is that they are fast moving, as suggested by their name. They will use their speed to escape from most threatening situations, and to add to their impressive ground mobility, they are also great swimmers and climbers. While usually choosing flight over fight, if they are cornered, they are not afraid to bite repeatedly and with extreme force. They have also been known to charge at people to frighten them. How Fast Is the Southern Black Racer? Racers are fast snakes, slithering at a top speed of about four miles per hour (6.5 kilometers per hour), about the speed a human walking quickly. If threatened, they use this speed to flee into bushes, tall grass, or the low-hanging branches of nearby trees. Do Southern Black Racers Shake Their Tails? If these snakes feel threatened, they are known to vibrate their tails in leaves and grass in order to mimic the sound (and appearance) of a rattlesnake. Because of this, they are often found resting or hunting in grassy areas. When Do Southern Black Racers Breed? 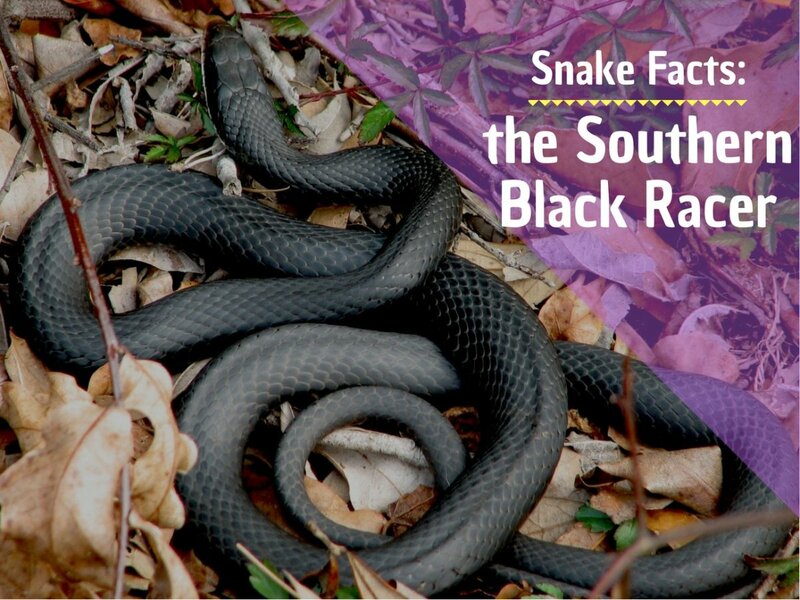 Southern black racer snakes breed and lay eggs between March and August. The female can lay up to 23 eggs, and, once hatched, the young, freshly-hatched snakes measure around six inches (15 cm) in length. As with other reptiles, they do not protect nor feed their young. Are Southern Black Racers Endangered? The black racer is considered an endangered species, according to the Association of Fish and Wildlife Agencies. In Maine, racers are limited to the southern third of the state and could be lost entirely if their habitat continues to be destroyed by human activities. Man is the greatest enemy of these snakes. They are often killed accidentally on highways, or intentionally by humans operating out of fear. 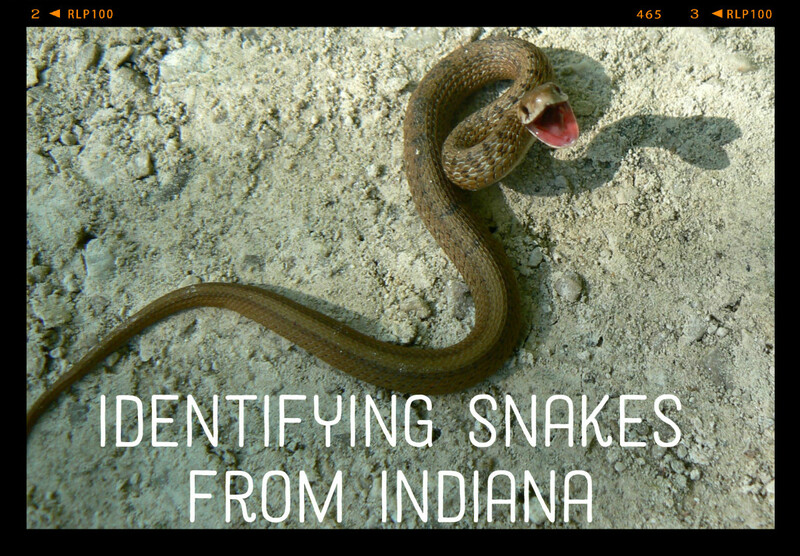 By educating the public and teaching them how to identify these non-venomous snakes, perhaps their numbers will cease to decline. 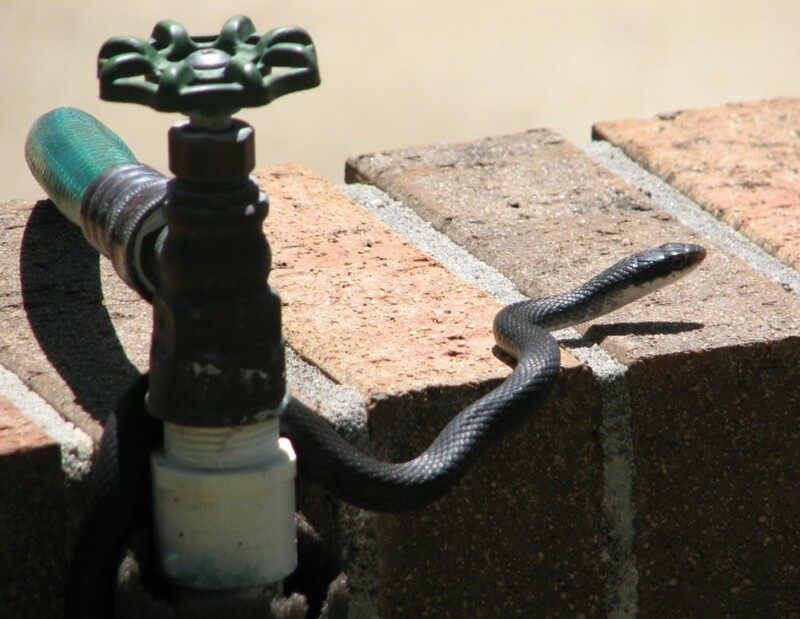 Do Southern Black Racers Keep Poisonous Snakes Away? There are a few myths associated with black racers that this article aims to expel, one of these being that they fight off venomous snakes. While black racers do sometimes eat other snakes, there is no evidence that they actively target venomous snakes. In fact, they prefer rodents to other types of prey, and they sometimes hibernate with venomous snakes like copperheads and rattlesnakes. Another myth is that black racers mate with copperheads to create venomous, black snakes. This is not true. The myth stems from the appearance of juvenile black heads, which have colored markings similar to those of the copperhead. These markings fade to black, though, as the snake reaches adulthood. Yet another myth is that black racers are entirely harmless. While it is true that they are not venomous, their bites are very painful and may become infected if not cleaned and treated properly. Still, if you see a black racer in your garden, you should let it be. Simply keep your distance to avoid being bitten. Palmer, E. Laurence, ed. (1974). Fieldbook of Natural History (2 ed.). McGraw Hill. ISBN 0-07-048425-2. Stejneger, L.H., and T. Barbour. 1917. A Check List of North American Amphibians and Reptiles. Harvard University Press. How do I get a black racer snake out of my garage? You have three options: leave it alone as it's basically harmless and will kill small pests, brush it out of the garage using a broom, or put some gloves on, pick it up, and carry it outside. You should be sure that it is a black racer and therefore non-venomous, before considering handling it. I have two (at least) black racers in my yard (Merritt Island, FL), and I don't mind them at all, except I now have a tame squirrel that I raised from a baby. He lives outside, but comes in every day to visit. I am terrified the snakes will catch him. 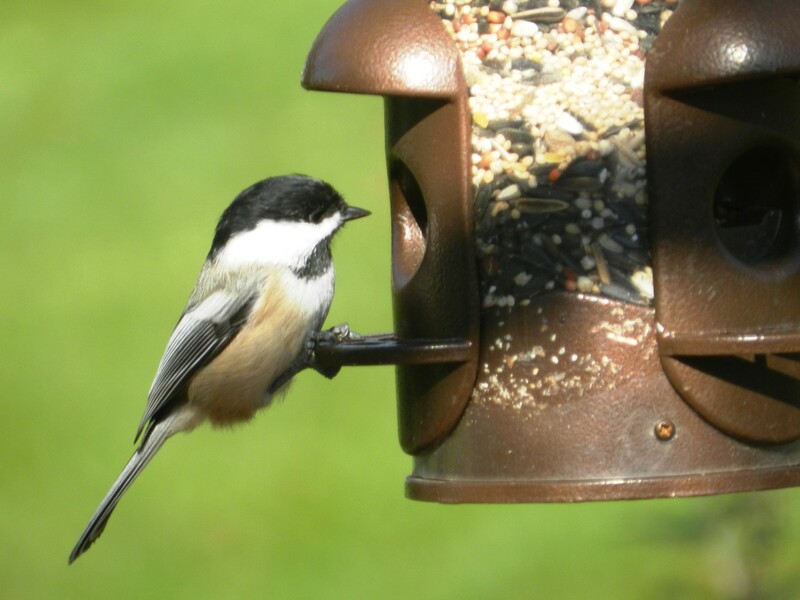 Are they dangerous to squirrels? Adult squirrels are generally too big for a black racer. The black racer has no venom, and lacks the body strength of a constrictor. They swallow their prey whole, so prefer smaller animals. Do black racer snakes have black heads and red or brown bodies? Black racers are completely black, apart from a white chin and a grey underbelly. There is no red or brown. There are, however, other subspecies of the Coluber constrictor which are colored differently, such as brown racers, tan racers, blue racers, or green racers. I got bit several times by a black racer. I know they are nonvenomous but do they carry any diseases to be concerned with? You should still be concerned about infections, even though black racers are not venomous. First, run the bite area under fresh water, no soap. Next, clean the wound with a mild anti-bacterial soap. Don't use soaps that contain alcohol, which can cause irritation, or hydrogen peroxide, which can slow the healing process. Dry the bite area by dabbing with a clean, dry cloth or towel. I would advise against bandaging the wound, unless there is a risk of cross contamination, as it can increase the chances of a bacterial infection. If you experience any sign of infection or an allergic reaction, seek medical treatment immediately. Do black racers like water? We saw a snake in our pool. They are good swimmers and don't mind being around humans, so are often found in yards. It's therefore feasible that it was a racer in your pool. They will eat animals such as frogs and toads which are found in watery environments, but they also live and hunt in a variety of other terrains not just near water. What should I do if a black racer bites me and holds on? 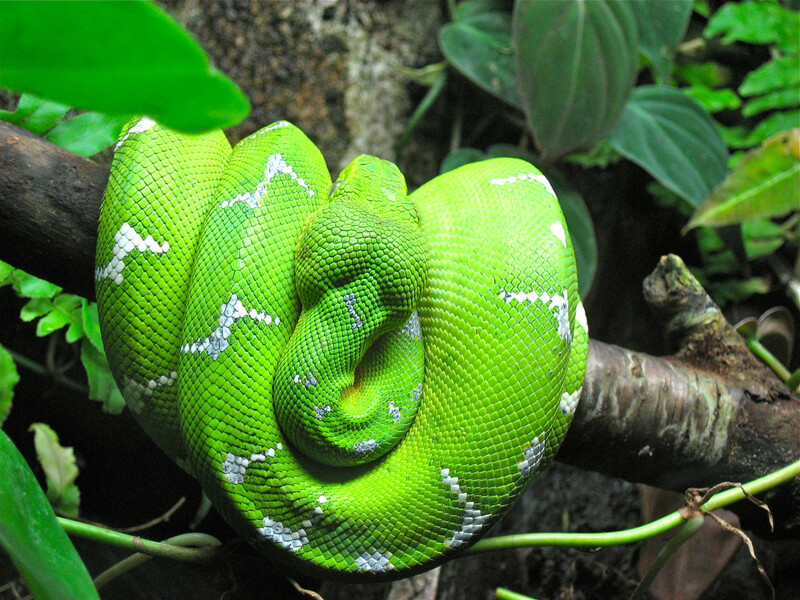 Most snakes will bite and release when it is a defensive bite. If the snake won't or can't let go, however, don't be tempted to try and pull the snake away, as this can tear your skin. You may also break the snake's teeth. This is because their teeth are curved to give them a better grip on prey. Instead you should firmly hold the snake behind its head and slowly push it towards the wound. Once the teeth are out, you can then pull the snake away. What do I do if a black racer bites me? Black racer snakes are non-venomous, so if you are sure it was a black racer, then you shouldn't come to any serious harm. Their teeth are sharp, however, and can make you bleed, so you should treat the wound to prevent infection. Irrigate the wound with fresh water, initially without soap. Then clean the wound with a mild anti-bacterial soap. Soaps that contain alcohol should be avoided, as they can cause irritation. Also avoid using hydrogen peroxide, as it can slow the healing process by damaging healthy flesh. Dry the bite area off by dabbing with a clean, dry towel or cloth. Do not bandage the wound, unless there is a risk of cross contamination, as it can increase the possibility of bacterial infection. If you experience any signs of infection or an allergic reaction, seek medical treatment immediately. Can I keep a black racer snake as a pet? 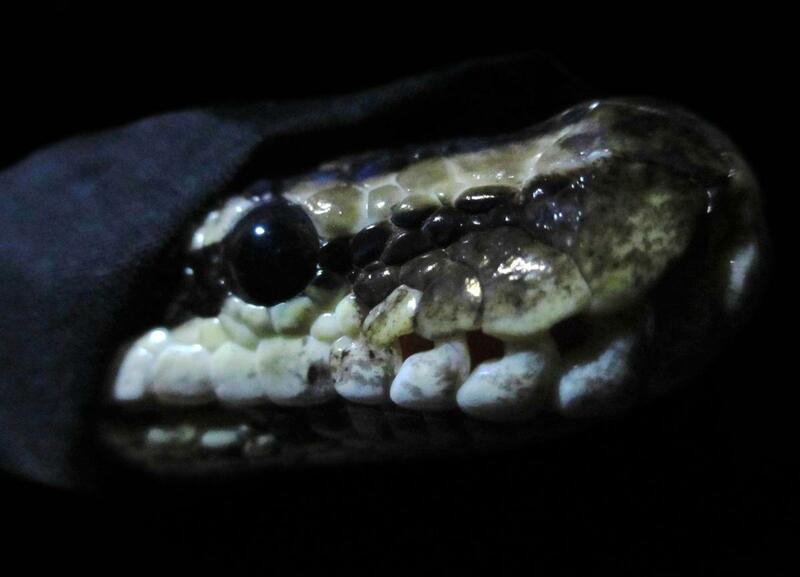 Black racers do not make good pets, and I would strongly advise against it. They don't like being handled by humans, even if kept in captivity for a long time. They will strike out violently if held. They also have vast territories in the wild (about 35 acres), and so need a very large living area. Do black racers love living in thick hedges? Whenever I trim mine he comes out the top every time. Yes, they love thick hedges and thickets, as well as forests and fields. They aren't too worried about humans and are commonly found in suburban yards (including my own). I live in Spring Hill, Florida, and it is commonly believed that black racer snakes keep rattlesnakes and other venomous snakes away, so no one bothers the black racers in their yards. Is there any truth to this? Black racers won't generally keep other snakes away. They do sometimes kill and eat other snakes, but they usually prefer other prey. Black racers have been known to hibernate with other snake species, including rattlesnakes and copperheads. How long do black racer snakes live? They live for up to ten years in the wild. I have a black racer snake in my yard, and my two cats like to get close and chase it. Are my cats in danger? Black racers are non-venomous. They like to crush their prey and swallow it whole; typically small animals such as mice and frogs. A cat is generally too big to be in any serious danger. Do black racers chase people? This is a common myth. Although non-venomous, black racers are very fast moving and so can cause panic if they are coming your way. However, it is not their normal habit to chase people deliberately. More likely you are both heading in the same direction, trying to get away. Thank you for providing so much information about these snakes. I have a 2 1/2 ft. black racer my female cat brought in through the cat door, it's been in now for days but I can't ind him any advice? I guess the cats brought this black racer into the house, it was about 18" long. It was curled up and I scoop it into a box and set it free outside. The cats are always staring at an overgrown corner in the neighbors yard so I suspected they was something living there. Now that I had a taste of one do I need to check that area for a mom or eggs. I've lived in western Broward County (FL) in the middle of a fully developed and largely manicured subdivision for two years. Last year, it was the weird Cuban bullfrogs coming in my yard...this year it is the black racer snakes. Perhaps the former begot the latter. I don't know why these racers try approaching the house door....you would think they know it isn't a bush. Nonetheless, I have two small dogs and my worry is for them. When we see the snake, we catch it with one of those snake pole-grabbers (we bought a five footer for piece of mind) and transport it in the bag supplied to a drainage pond running along the uninhabited side of the road, hoping they do not have a sense of directional memory! 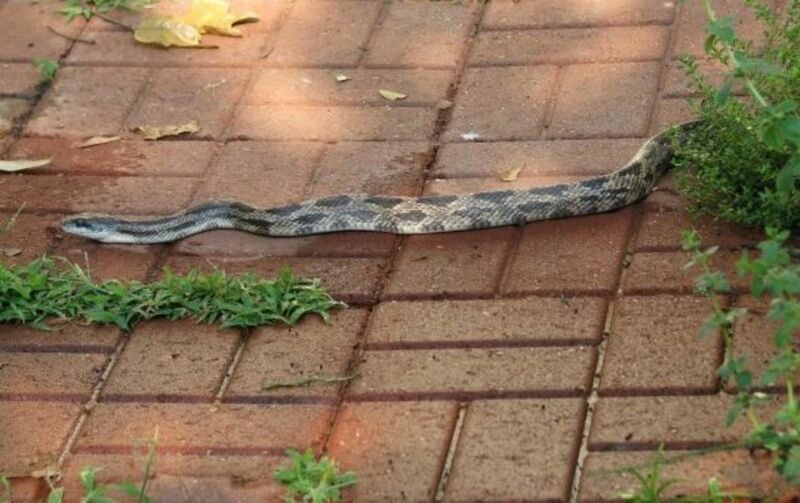 I have a great fear of snake, you can imagine my reaction when i found two inside the house within a span of 8 hours and another one a month later which was today. Found it resting under the couch. Where to they come from and why do they keep coming to our house? Haven't spotted any rats or mice just a few lizards. It's difficult to say for sure, but I think you might be witnessing the black racer's attempts to mimic a rattlesnake. They are known to do this and I've experienced it myself. and one time I was blocking her path she darted away two feet then came back slowly as I watched her she waved her neck, she then tried again stopped waved her neck then went behind me while I was laying on a lawn chair stopping twice and waving then finally under my feet beside a wall then shot into my wood pile. Just surprised by one on my patio. Jumped a mile but they are harmless. heard and saw a bird swooping around and around. when I looked down at the pile of leaves, there was the snake. still trying to decide what to do. thanks for the article, it helped!! This article, though informative, does not adequately describe their behavior in captivity. I have 3 adults, all wild caught, (well, one was found in a pool and the other two were found in the road, one actually got run over, but their tough) and they are as tame as any rat snake. They feed readily on live prey and after being tamed down for a week each, have never struck at me or anyone else. do they live in virginia? i have a mean baby snake in a jar right now! 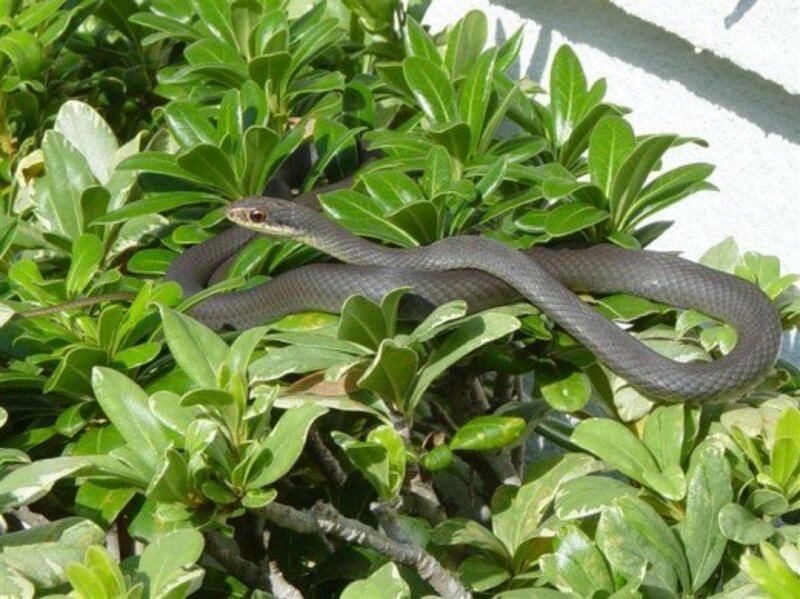 Years ago when living in Palm City, FL, my wife opened the front door to the house to find a Black Racer on the door step. It scared both of them! The snake made a mad dash for the first safe place it could find, which was in the house and up inside the couch. I got a call at work. COME GET THIS SNAKE OUT OF MY HOUSE!!! Ever try to get a snake out of a couch? No?! Well, it tain't easy. And when Paul here says they will strike out, he's not kidding. They are very grumpy snakes and if they have something to push against, they can strike farther than their own length. Uhm yeah, take my word on that. Although I cringe at the thought of encountering these, I do appreciate the need for education about them. Thanks for publishing a hub dedicated to black racers. Recently upon leaving church after a rainstorm, my son and his friend stepped on one trying to come in out of the rain. It whipped away so fast, we barely knew what to think. I'm glad they are not poisonous, although we do have cottonmouths, copperheads, and rattlesnakes in Tennessee. Keep writing! I encounter Southern Black Racers fairly regularly down here in Florida, I've seen five of them in the last six months. As soon as I know it's not a Water Moccasin/Cottonmouth, I relax a bit. It's important to remember that snakes form an important part of the ecosystem, even if us humans don't like them. I really came upon a Black Racer and if I did I might do the same as everyone else. Most people believe that the only good snake is a dead snake. I hate snakes, so I had to read this! (Kind of like not being able to look away from a car accident.) : ) Interesting article.